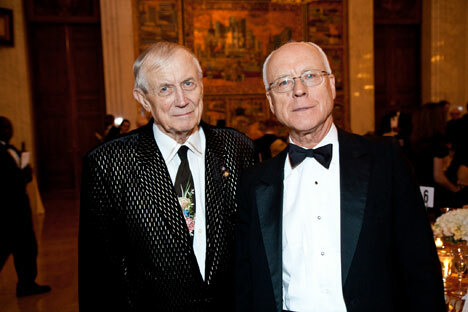 The famous Russian poet Yevgeny Yevtushenko(l) and Alexander Potemkin(r) at the American-Russian Cultural Cooperation's event. Source: Press photo. Alexander Potemkin is the man behind ARCCF, a foundation of goodwill celebrating 20 years of cultural cooperation. Alexander Potemkin never planned on becoming one of Washington’s veteran insiders, running a foundation on 17th Street for two decades. In fact he still seems surprised when he talks about how he first came to be the executive director of the American-Russian Cultural Cooperation Foundation (ARCCF), which is celebrating its 20th anniversary this year. Potemkin was the last cultural attaché in the Soviet Embassy, and the first cultural attaché for the new Russian Federation under Ambassador Vladimir Lukin. “It was a climax of interest and cooperation,” he said of the final days of the Soviet Union. Initially he thought he would only stay in the U.S. for a while to help set up this new foundation. But his relationships with Russian museums and cultural institutions proved invaluable. On Nov. 15, ARCFF will hold its 20th year celebration at the Russian embassy while saluting the war of 1812. The Annual Foundation award will be presented to Donald Kendall, former chairman and CEO of Pepsico and a longtime member of ARCCF’s board of directors. The Hon. James Symington, chairman of the ARCCF board, is a former congressman and director of the Atlantic Council. Symington will offer his remarks, and award a student with the James Symington Scholarship for the study of Russian language, culture and international relations. “As an organization ARCCF is proud to reach the age of the average college student—a fitting parallel given that the young of our two countries hold our joint future in their hands,” Symington said in his statement. Executive director Alexander Potemkin said he is optimistic of a return to the renewed interest and friendship America and Russia felt toward each other two decades ago, when he first started this job. “In 1993, my term [as attaché] was over,” Potemkin recalled, and he applied to Ambassador Lukin “to stay on for a while.” He retired from the diplomatic service in 1993, and received authorization from both the Russian and U.S. governments to stay on and become an advocate for cross-cultural exchange and promotion. Since then, the ARCCF has arranged performances by Russian and American performers in D.C. as well as exhibitions in both countries. The organization’s most recent exhibit was also among its most significant. “The Tsar and the President” explored the relatively unknown friendship between Tsar Alexander II and President Abraham Lincoln. In a series of powerful letters, the two leaders shared their thoughts and reflections, as well as a shared commitment to emancipation--of serfs in Russia and slaves in the United States. On the 200th anniversary of Pushkin’s birth, ARCCF commissioned and erected a monument to the poet at 22nd and H on the campus of George Washington University. A “reciprocal” Walt Whitman monument was created and erected on the grounds of Moscow University. Potemkin, who tirelessly facilitates these exchanges, graduated from Moscow University with a degree in history in 1961. After a stint as a history teacher, he landed a job with the Soviet Union’s Foreign Service. In the late 1980s and early 1990s, the enthusiasm for cultural exchange between the U.S. and Russia was at all time high. Potemkin said that even in times of political tension, cultural exchange offers “a clear barometer” of goodwill between the two countries. He recalled the first time the new Russian Embassy on Wisconsin Avenue opened its doors for festivities; Symington, the distinguished chairman of the ARCCF board, was at the piano, quite ably singing Russian folk songs late into the night. It seemed to Potemkin that the open doors and the warm glow from inside marked the beginning of an era. “1812: The Anthem, the Overture and Salute to Diplomacy” gala at the Russian Embassy on Nov. 15 commemorates the war of 1812 in the U.S. and America.